Bringing in the New Year is often the perfect time to turn a new page in your life, which is why so many people make New Year’s resolutions. According to some of the latest research, approximately 50% of the population makes resolutions each New Year. Some of the top ten resolutions for 2017 were weight loss, exercise, stop smoking, quit drinking, better money management, debt reduction, learn something new and enjoying life more. Spending more time with family, barely made the list at ninth, and marriage specifically, wasn’t mentioned at all. While the top ten are all noteworthy goals, wouldn’t it be great if something like, ‘How to Build a Stronger Marriage’ was number one? After all, shouldn’t our marriage relationship be first priority? What if husbands and wives made a New Year’s resolution in 2018 to be more committed and devoted to each other? Think of the benefits for each partner, the marriage and the family! Now I realize that New Year’s resolutions have a history of being rather short-lived when it comes to follow through. Researchers have found that success rates of peoples’ resolutions usually look something like this: the first two weeks usually go along beautifully, but by February, people are backsliding and by the following December, most people are back where they started, often even further behind. Why do so many people struggle to keep their resolutions? Too often the primary reason for resolution-dissolution is our goals are too lofty, which only sets us up for failure. It’s been proven that smaller, more realistic goals have a much better success rate. This is where I come in. Each month I plan to post an article on How to Build a Stronger Marriage, giving you realistic and attainable goals that can help improve your relationship with your spouse. So I hope you will follow along and we can take small steps together toward building a stronger marriage. Where does it start? I believe it begins by making a renewed commitment to your partner. The importance of commitment to success in love seems so obvious that you might assume mentioning it is a bit redundant. But many couples are unaware of how a lack of commitment is often at the root of many marital problems. So, let me begin by stating a very basic assumption about marriage: Marriage was intended to be a deeply committed relationship. To express how strong the marriage commitment should be, the Bible describes marriage as a covenant relationship. If you’re familiar with the Old King James version of Scripture, or just the traditional wedding vows, then you have heard the terms ‘leave and cleave’ used to describe the bond of commitment between the husband and wife. A man shall “leave” his father and mother and “cleave” to his wife… (Genesis 2:24). From the beginning God intended the marriage relationship to be most unique because of the commitment required. The Hebrew word for ‘cleave’ means: to cling, to hold fast together, to be joined together—to be glued or welded together. These terms are much more than just giving rhyme and rhythm to the wedding ceremony; they are the language of covenant; expressing the depth of connection intended in every aspect of the marriage. Where does it start? I believe it begins by making a renewed commitment to respect, cherish and appreciate your partner. Think of it this way: Marriage is a relationship that was never intended to be broken, which means, it’s not a consumer relationship. In other words, it’s not something you invest in as long as your needs are being met, but then discard when it’s no longer fulfilling your desires for happiness. The essence of marriage is a sacrificial commitment for the good of the other. Pastor and author Tim Keller, defines covenant as “…a deep, exclusive, permanent, legal and personal binding commitment that two people make to each other.” Covenant means that love is more fundamentally an action based on commitment than an emotion. That doesn’t mean that marriage is merely a social or legal arrangement, void of any deep heart felt affection and feeling. In covenant, we see how God brings together both feeling and duty, passion and promise. We shouldn’t disparage the need and importance for our commitment in marriage to be expressed in a legal binding contract. But how sad if we allow a legal document to be the extent of our commitment to our marriage partner. Much more could be said on this point, but I’ll leave you to Tim Keller’s excellent book, The Meaning of Marriage, in which he argues so clearly why the marriage commitment is a covenant relationship. Marriage expert and researcher, John Gottman, says a committed relationship is a contract that two people make to give each other mutual trust, respect, nurturance, and protection. Anything that violates that agreement can become traitorous. In his book The Seven Principles for Making Marriage Work, he identifies seven key principles that make up what he calls the Sound Relationship House. 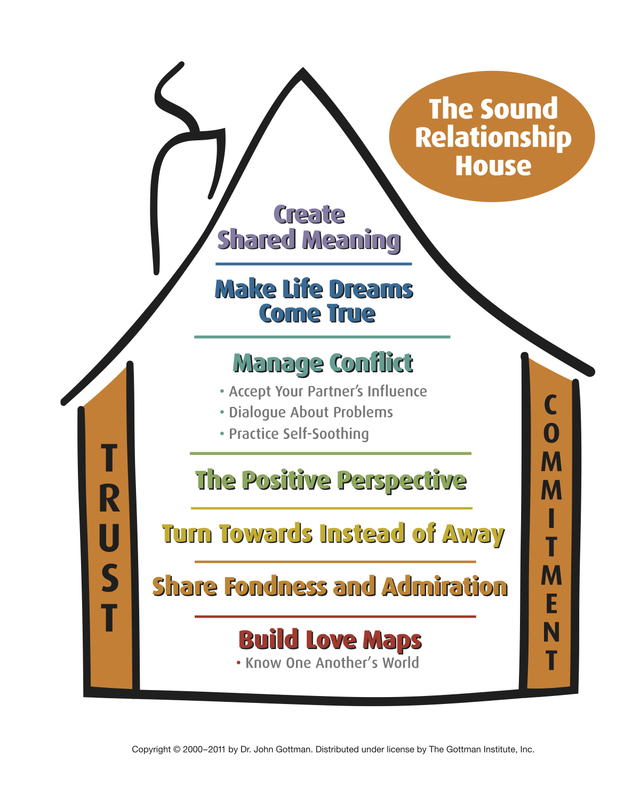 As you can see from the illustration below, it’s the critical components of commitment and trust, which form the house’s protective, weight-bearing walls. 1) Assume the best about each other and their relationship. 2) They are able to acknowledge each other’s perspective, at least to some extent, even when they strongly disagree. 3) They report feeling distressed when the other seems unhappy or hurt. 4) Their happiness is contingent on their partner’s feelings. 5) They are attuned to each other’s emotions, share an abiding empathy, and have a high degree of trust. Conversely, at the other end of the commitment spectrum are couples who struggle with making a strong emotional connection with each other. 1) They demonstrate a lack of mutual understanding or faith in their relationship. 2) One spouse’s moods is unable or unwilling to connect to their partner’s emotions. 3) They assume the worst about each other to the extent they become trapped in an absorbing state of negativity. As noted, there are many positive aspects to what it means to be committed, but commitment also means that we close the door to any form of betrayal in the relationship. We tend to think of infidelity primarily in sexual terms, but an extramarital affair is only one type of disloyalty that threatens a marriage. Betrayal is, fundamentally, any act or life choice that doesn’t prioritize the commitment and put the partner “before all others.” Nonsexual betrayals can destroy a relationship as thoroughly as a sexual affair. Other forms of betrayal include being emotionally distant, siding with a parent against one’s mate, disrespecting the partner, and breaking significant promises. The truth is that most of us are guilty of some form of unfaithfulness from time to time. But when either spouse consistently undermines the marriage commitment, danger follows. In fact, Gottman’s research in his Seattle Love Lab found that some form of betrayal lies at the heart of every failed relationship. Here are three subtle forms of betrayal that undermine commitment and have a devastating impact on the marriage. Unfortunately this happens often in marriage, where at least one spouse chooses not to be honest with their partner because they fear the unwanted consequences. In many cases the fear is dismissed by convincing oneself that honesty on their part is only being selfish and demanding. To be sure, being selfish or demanding are extremely harmful to a marriage. However, asking our partner for what we need and desire is not being selfish; it’s being honest. When we choose not to be completely forthright in what we need and desire, we are deceiving ourselves and our spouse and not allowing the marriage to be what God intended; a relationship of mutual trust and commitment. The “unwanted consequences” that we are so often afraid of are actually the means to a healthy relationship. Only when spouses are truly honest with each other does it create the opportunity for needed change and growth in the relationship. The point is, every bid made in a relationship creates an opportunity for connection. When one partner expresses a need for connection, the other’s response is either to move toward their partner, or turn away. Any response that doesn’t demonstrate interest misses the opportunity for connection. Every marriage is full of missed opportunities and even the best of couples experience times when they fail to respond to their partner’s bid for connection. Sometimes the partner is too tired or just preoccupied. Often, we interpret our partner’s bid to be so trivial that we think our response, or lack of one, is unimportant. Missing the opportunity of a minor bid doesn’t necessarily damage the relationship. But when one partner consistently fails or refuses to respond to their partner’s bid for connection, it indicates a serious problem in their commitment on an emotional level, and signals pending danger for the marriage. Over time, one partner or both begin to wonder: Do they even care, or is someone or something else more important? Is my partner truly committed to me? Can I risk continuing to trust? Commitment in marriage means that we pay attention to our partners bid for connection and we learn to respond in loving ways. Gottman calls these moments “turning towards” each other to build connection. 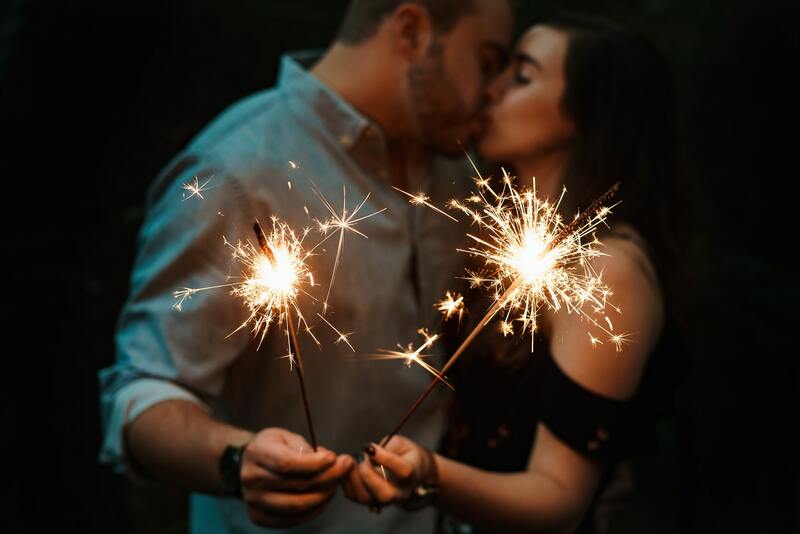 Couples who learn the importance of connecting on this level are practicing the power of “attunement” and build deep mutual trust in the relationship. In his book, What Makes Love Last, John Gottman calls these unfavorable comparisons, Negative COMPS, and while they may lead to one or both partners having an affair, for many couples these betrayals doom the marriage to a painful and dismal co-existence. Sometimes both partners are aware that one is making negative COMPs, but neither acknowledges nor recognizes the danger. They figure that no one is ever completely satisfied with their life. So, the disloyalty doesn’t seem “as bad as” an affair. But it is. Is there a way to recover from Negative COMPS? The answer is ‘yes,’ and it begins with a renewed commitment to respect, cherish and appreciate your partner and the marriage! Remember, Negative Comps begin wherever there is conditional commitment. Addressing the pain and disappointment of failed attempts to connect is never easy. But pursuing the hard work of building a strong emotional connection is rewarding and it safeguards the marriage.